In a small bowl mix flour, baking powder, baking soda, salt and nutmeg together. Set aside. In large bowl cream together sugars and butter until creamy and fluffy. Add in eggs, egg yolks and vanilla and beat until smooth. Add flour (in thirds) alternating with the coconut milk (ending with flour) until well blended. Pour into prepared bundt pan and bake at 350F for 55-60 min. While the cake is baking make the rum mixture by mixing the remaining coconut milk in the can (approx 3/4 of a cup) with 6 tbsp of sugar. Heat until sugar is dissolved Do NOT allow it to boil. Add in 1/2 cup of rum and set aside. When cake is out of the oven immediately poke holes in it without removing it from the pan. (Make sure you add enough holes so that the rum mixture is spread throughout the cake.) Pour 2/3 of the rum mixture slowly over the cake and allow it to sit in the pan until it is cool, and the rum mixture has soaked in. When it is cool, turn the cake out on to a plate, and brush the remaining rum mixture over the top and sides of the cake until it is completely absorbed. Top with the glaze (recipe below). Toast 1/2 cup of fresh sweet coconut in non-stick pan – watch it carefully. Remove the coconut from the pan and set it aside in a bowl. In the same non-stick pan, melt 4 tbsp of butter. Add in the rum, and brown sugar and cook until it begins to thicken – this will not take long. 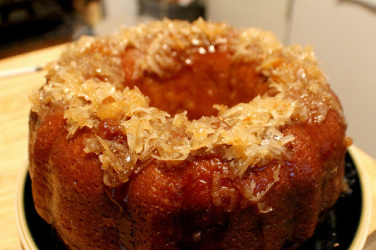 Toss the coconut back in, and pour the glaze over the top of the cake.